The Monsters Inc Meet and Greet location will be closed for refurbishment May 14–24, reopening May 24th as the Monsters University Student Union. NOTE: Mike and Sulley will also appear in these costumes for 24 hour day at the Magic Kingdom on May 24. Expect them to appear late into the night. I really like the new costumes, what are your thoughts? Previous PostMickey’s Very Merry Christmas Party Dates and CostsNext PostChip n Dale to appear as Ewoks for Star Wars Weekends! Do you know what their meet and greet times will be starting 5/25? Thanks! Do you know if Mike and Sulley will still be available for a meet and greet at a different location during the refurbishment? We will be there during that time period and my 3 year old has been dying to meet them. 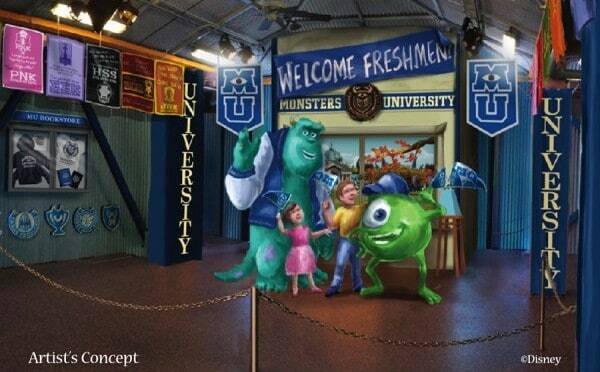 It’s been confirmed that Mike and Sulley will not meet during the refurb.